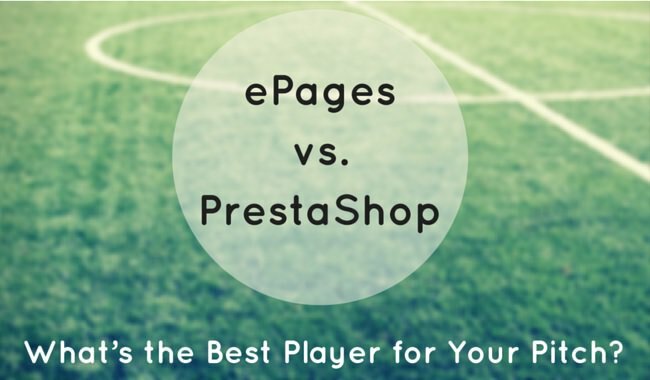 ePages vs PrestaShop: What’s the Best Player for Your Pitch? So, you’ve got an objective - starting an online business, and, when you’ve already thought over the products and overall concept of the store, your next step is selecting a platform for your prospective online home. It can prove to be more overwhelming than you might have thought before. No wonder, you’ve got a lot of questions to answer, like: open source or licensed, hosted or self-hosted, responsive or not, customizable or rigid as is and so on. Another very important factor to consider is the price. You might be surprised to find out that there exist free open source carts, but nevertheless people still use paid ones. Time to sort things out and decide on your platform of choice between ePages shopping cart and PrestaShop. ePages vs PrestaShop - Who’s Who? Even if you’re a newbie in the e-Commerce sphere, there’s no doubt that you’ve heard the name PrestaShop. This cart has been around since 2007, and now it makes a very strong competition to Magento - the top shopping cart on the market. It constantly introduces innovations and updates, and enjoys wide popularity among merchants all over the world. PrestaShop, that originally was open source only, now offers hosted version as well. That enables PresStop platform to meet the needs of every single merchant with no exceptions. ePages software is known in a much more narrow circle of users, though it’s 5 years older than Presta. As well as PrestaShop, ePages provides a cloud shopping cart, so you need nothing more than a computer with Internet to start selling online. Oh, and don’t forget about the monthly payments for the conveniences - ePages software isn’t free. The price depends on one of the four plans you select. They differ according to the type of businesses - from small ones to huge. Below, you’ll find the Google Trends depiction of the popularity of both carts in question and its change over years. In 2008, it looks like ePages and PrestaShop were even, but since that time Presta has seen a steady growth, while ePages - vice versa. Now, let’s get to the gist and compare the platforms in the essential aspects. As to the options for effective sales, they are in abundance in both platforms. ePages comes in 15 languages while PrestaShop presents virtually no limits for international trade with numerous translations and language packs. ePages includes multiple payment gateways like PayPal, SagePay, Skrill, WorldPay, Google Checkout etc. As to Presta, out of the box about 20 payment methods come for free, among them are PayPal, Stripe, Skrill, Authorize.net. More options can be obtained in the Marketplace. ePages boasts versatile templates to all tastes that are easy to customize. Thanks to the drag and drop editor, even newbies can make their store look as wanted with no HTML or CSS knowledge or programming skills. It also features SEO cockpit for search engine optimization of your titles, meta descriptions, product tags, SEF URLs etc. Design is also one of the greatest advantage of PrestaShop platform. It is famous for the multitude of beautiful templates, both free and premium that can make a shop stand out of the crowd. Also, it does a great job with powerful SEO settings, allowing you to make the most out of it, plus free and paid SEO modules are available for most sophisticated needs. For many starting e-merchants, the issue of user-friendliness is very important. ePages is made to be an easy start - no complicated installations, intuitive dashboard, streamlined operations. Of course, it does take some learning, but overall it’s quite simple in use. PrestaShop latest version, 1.6, reportedly presents a sleek and efficient dashboard that’s easy and comfortable to navigate. Moreover, with introduction of cloud version, you’ll need just a few minutes to create a ready-to-use PrestaShop e-store. Though ePages is quite a good platform overall, it looks like PrestaShop would be a better decision for those who want to establish an advanced e-store. This solution offers a number of beautiful templates, great selling possibilities, wonderful usability and two versions to choose from: open source and hosted. P.S. Do you happen to own a store based on ePages and wish to migrate it to PrestaShop? Then, Cart2Cart can come in handy. This online service will move the data from your ePages to PrestaShop in a few hours accurately and very easily with no programming skills needed. Why don’t you start the free Demo now to see how simple the ePages store to PrestaShop migration can be?